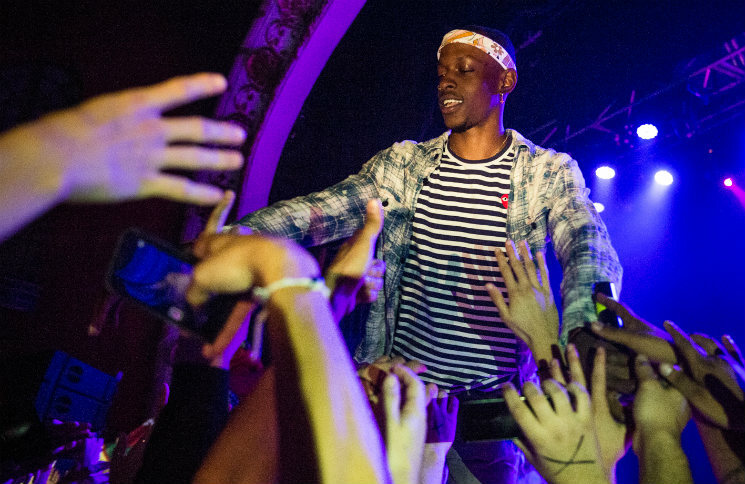 The Underachievers have two gears in a live setting: turnt and lit. Take your pick. Following calmly received pre-10 p.m. opening sets by underground crews Warm Brew and Injury Reserve, the headlining duo rushed the stage like two kids on a candy rush and barely slowed down for a breath. AKTHESAVIOR and Issa Gold run the stage like a sprint, not a marathon. The 20-something pair of Flatbush, Brooklyn wordsmiths are still in the early stages of their 24-date North American tour in support of their third studio full-length, this year's Renaissance, and if they expel as much energy every night as they did at the Opera House, they might not make it till November. Hammering the all-ages crowd with an jam-packed hour of hypnotic bass and skittering, intertwined rhyme patterns — at times, your ears had to squint to catch the metaphors — the dyed-blond AK and lanky, headband-sporting Issa had the club going up on a Tuesday. All the way up. These guys feel like cousins of Joey Bada$$'s Pro Era posse but under the influence of vintage Three 6 Mafia. The moment the DJ cued up the Beast Coast crew's entrance anthem, Evermore's "Allusions," the die-hards cramming the Opera House's low-level stage front began moshing and throwing hands up like it was Lollapalooza's heyday. Although the show wasn't sold out — plenty of elbow room was available in the upper bar space and $35 tickets were being sold at the door — the enthusiasm of the rowdy fans up front charged each track with an avalanche's force. Two young women climbed the dais and jumped off unharmed into the sea of sweaty outstretched arms. A couple of clowns got too rough and were briefly scolded by Issa; they left, and the party raged on as blue and green lights sprayed from the dimly lit stage. "Moon Shot," "Al Capone" and "Play That Way" all stood out. Throwbacks from the Underachievers' early 2013 mixtapes like "Leopard Shepherd" and "Gold Soul Theory" were just as well received as the new material. Wrapping up the fury with a performance of "Packs," the group's haunting new track that dropped only a few days ago, Issa addressed his spazzed-out devotees: "I love every single one of you guys," he proclaimed. "That was amazing." When the music stopped, AK and Issa took time to slap high-fives with anyone and everyone who approached the stage hoping their vitality is contagious.